The Peacock - they sometimes rest on high trees, but always make their nests on the ground, under the shrubs. he peacock is first mentioned in the Bible in the time of Solomon. He used to send his vessels to distant countries, and they came back once in three years, "bringing gold, and silver, and ivory, and apes, and peacocks." Solomon did not pray that God would make him rich, or that he would give him health, or let him live a great many years on the earth; but he said, "I am a little child, I know not how to go out or come in. Give therefore thy servant an understanding heart." Then God was pleased with what he asked, and besides giving him great wisdom, he gave him also riches and honor. He had forty thousand horses, and silver and gold in abundance. All the vessels used in his house were of gold, because silver was not good enough; it was "as stones" for plenty, and was "nothing accounted of in the days of Solomon." In the second chapter of Ecclesiastes, Solomon himself speaks of his riches, and after telling us of some of his treasures, he says: "Whatsoever my eyes desired I kept not from them; I withheld not my heart from any joy." Perhaps you think he must have been perfectly happy, if any man in this world ever was; but what does he say? "All is vanity and vexation of spirit." This does not sound much like being contented. No, dear child, these are not the things that make us happy; nothing but the true love of God in the heart can do this. There was once a foolish and wicked emperor who cared little for any thing excepting "what he should eat, and what he should drink, and wherewithal he should be clothed." He took great pride in telling how much his dinners cost, and how much trouble it gave people to prepare them. One of the dishes that pleased him, because it cost money enough, and time and trouble enough, was made up of the tongues of flamingoes, (a kind of bird,) and the brains of peacocks-do you envy such a king as that? 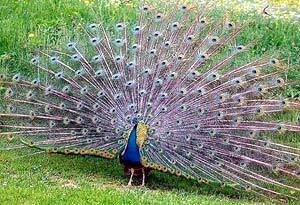 The peacock is a very splendid bird; its colors are most rich and beautiful. The feathers of the tail are often more than a yard long, and when they are spread out in the sunlight, like a great fan, nothing can be more elegant. Yet with all its beauty I do not believe you could ever love a peacock, as you love a lamb or a dove. It seems selfish and vain, and there is nothing lovely about it-its voice is very harsh and disagreeable. There are some people who, like the peacock, are called handsome or beautiful, but whose hearts are not pure and lovely in the sight of God. "Beauty," in itself, "is vain;" but "the ornament of a meek and quiet spirit is in the sight of God of great price."